Being the author of a relatively successful D&D blog comes with its perks. One of the perks being that publishers seek you out for your reviews and opinions, lavishing you with free stuff along the way. 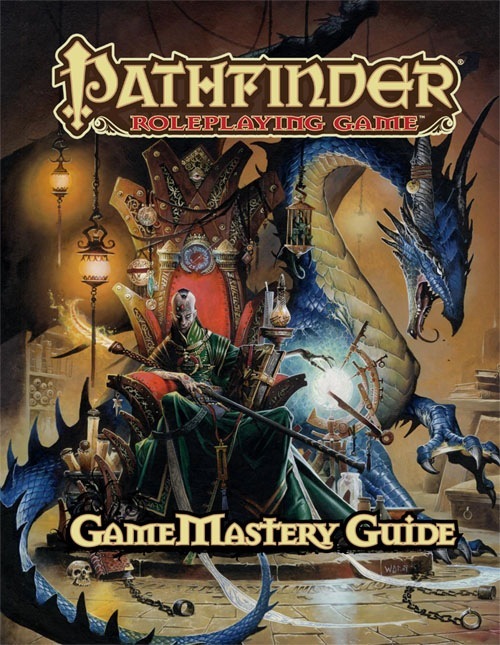 A gaming friend of mine recently got himself a copy of Paizo’s Gamemastery Guide for the Pathfinder Roleplaying Game. It’s essentially their version of a DM’s Guide, written by a multitude of authors, and let me tell you something… this thing packs quite a punch, whether you play Pathfinder, 4e, or any other edition. Weighing in at 320 pages, the amount of fluffy stuff in this book makes it worth a valuable book for any new DM out there. So let’s take a look at the non-Pathfinder specific things inside, for us 4e DM’s out there. If there’s one thing that can be said about the Pathfinder books, it’s that they are gorgeously produced, and this book is no exception. The cover art by Wayne Reynolds is a nice piece, and the interior artwork in the book doesn’t disappoint either, with full color art throughout the book. But forget the artwork, because the main appeal of this book for me, a 4e DM, is the content, and that’s why I liked it so much. So while, yeah, there’s a Pathfinder logo on the cover, disregard it and take this book for what it is. DMing advice that maybe you’ve seen in scores of other books here or there, but worth reading and having on your shelf nonetheless if you don’t already own it. The names behind this book are a pretty strong list of who’s who in the industry, including names like Wolfgang Baur, Dave Noonan, Robin Laws, Sean K. Reynolds, and Skip Williams amongst others. These are all big names in the small world of fantasy RPG’s, instantly giving the book major cred. Chapter 2 goes into the actual nitty gritty of running games. Do you use minis, or go all abstract? Props, using voices for npc’s, narrative techniques, pacing and all sorts of non-Pathfinder exclusive stuff is covered here. A good read for the beginner, eh, newbie DM, and a good refresher for the more experienced DM’s out there. There are tons of cool charts you can pick up and use right now for your game as well, whether it’s Pathfinder, 4e, or anything else. Charts on plots, McGuffins, cultural titles, and a whole page titled “Words Every Gamemaster Should Know” with hundreds of words to add to your descriptive vocabulary. Cool stuff. Chapter 3 is all about PC’s, the part of the game DM’s don’t have any control over. This chapter talks about introducing new characters, player knowledge vs. character knowledge, handling character deaths, tpk’s. Again, all this stuff is rules-free, so it applies as solid advice to any DM running any game. Chapter 4 is all about NPC’s, and bringing them to life. There are more random charts here as well, for NPC’s backgrounds, goals, physical and personality traits, that sort of thing. These are charts that you can take and use right now, in any game you are playing. Want a crapload of NPC professions? There’s a list here with hundreds of them. Chapter 5 is about rewards, be it in the form of XP, treasure, spells, or anything else. This may be one of the chapters with the most system specific stuff in it, given its nature. What is of use to us non-Pathfinder players here is stuff like making rewards interesting, story rewards, and things along those lines. Chapter 6 is devoted to world building, and it is a great chapter. It is a chapter I wish 4e had in one of its two DMG’s, as it’s useful for those DM’s that enjoy creating and building civilizations and worlds. Topics ranging from creating world maps, to designing a feudal or agrarian society are touched on here. Good, solid material like religion’s role, the cosmos, time and space are also covered in this chapter. This was my personal favorite, and the one I’d likely refer to more often if I owned the book. Want to create parallel worlds for your campaign? This chapter shows you how. I love it. Chapter 7 is all about adventure, whether they are planar, city, or dungeon based, you’ll find advice here. Planar adventures are obviously all about the Pathfinder cosmology, but things like a tavern generator, 100 city locations, and shop names are system neutral, neat things to have. I mean, there’s even a chart for things found on the side of a road. C’mon, this is great stuff to have next to you at the table. Chapter 8 is the “Advanced Topics” chapter, dealing with things such as gambling, drugs and addiction, running chase scenes, and riddles. There are some Pathfinder specific things here, like sanity rules, which with some thought could probably be easily converted to 4e, but for the most part it is a system neutral chapter as well. The chapter also introduces a sort of mini-game to deal with in game chase scenes that seems pretty interesting, breaking down the chase into skill checks, and using cards on the table to simulate the chase. It’s almost like a modified skill challenge, or so it seemed like to me. There’s also a section on natural disasters that does reference things like Challenge Ratings, making them Pathfinder specific. Chapter 9, the last chapter, is an NPC Gallery. These are all sorts of characters, broken down by type, and available in different challenge ratings. So for example, it’ll offer a “City Watch” group of characters, and then a Challenge Rating 1, 3, and 6 version of it. Pretty useless for the non-Pathfinder playing DM, except for maybe the fluffy descriptions. There are tons of archetypes here, like military men, nobles, marauders, sailors, and heretics to name a few. The Appendixes have recommended movies to watch, along with music and literature to capture the feel of fantasy gaming. It also provides sheets or campaign tracking, settlement descriptions, npc’s and so on. So, here I am reviewing, and liking a book for the version of the game that I do not enjoy playing. But you know what? It’s a damn good DM’ing book, more so if you are a newbie dm getting your feet wet in this art. Is there anything I don’t like about the book? Well, one, that it’s not made for the game I play. I can’t judge the rules bits because I don’t play the game. The art is solid, the pages are packed with words, there is almost no wasted space, and the advice is damn good. Is it going to make me switch to Pathfinder? Not really. But I can appreciate it for what it is. A DMing book chock full of advice, tips, charts, and wisdom fit for any DM, of any game. And that’s good enough for me. At $40, it is a pricey book though, especially if you aren’t playing Pathfinder. However, if I were playing that game, I wouldn’t think about it twice. Here is the products’ page. Gah! You have almost convinced me to go out and pick up this book. There is no way I can save money if I keep buying all these different games. Darn you Newbie DM! But there was plenty of advice for me to use there. You did a review that I was gonna do next week. Lol. Now I have to ponder if it is worth it to do mine.. lol. Great review.. it really is an amazing book and a boon for a GM/DM.. No matter what system you play! The PDF is only $9.99 fully linked! I did a review of this book a week or two ago, from the perspective of someone who still plays AD&D 1E, and I came to the same conclusion. This is a terrific book, regardless of what fantasy RPG rules you’re running. The amount of Pathfinder-specific material is so minimal, it doesn’t detract at all from the system-neutral tables and advice. One place I disagree; I think it’s worth the $$ even if you’re not playing Pathfinder (and it was $26 at Amazon last time I checked, which is quite reasonable). This book sounds soooooo useful. I don’t have $40 laying around to dish out for it though, so I guess I’m out of luck.